SEOUL, Nov. 22 (Yonhap) — South Korea hosted its second Olympics this year, with the eastern resort town of PyeongChang staging the 18th Winter Games in February, 30 years after Seoul held the Summer Olympics. And the country is hoping PyeongChang 2018 won’t be its last Olympics. South Korea and North Korea have agreed to put together a joint bid for the 2032 Summer Olympics. No Olympic Games, summer or winter, have been shared by two countries before. In an interview with Yonhap News Agency in Seoul on Wednesday, Lindberg, head of the IOC’s Coordination Commission on PyeongChang 2018, said the top Olympic body has been promoting exactly what the Koreas look to do — sharing costs of staging an Olympic Games and ensuring they won’t have to build too many new venues that could turn into “white elephants” afterward. IOC President Thomas Bach has said he welcomed the intention by the Koreas to co-host the Olympics. But Lindberg said it was still premature to predict how things will evolve over the next 14 years. The IOC typically votes on Olympic host cities seven years in advance, which means the Koreas’ fate, if they reach the final bidding stage, will be determined in 2025. But the IOC made an exception for the 2024 and 2028 Summer Olympics. When several cities dropped out of running for the 2024 Games and left only Los Angeles and Paris, the IOC decided to award the two competitions simultaneously in September 2017. Paris ended up taking the 2024 Games and LA was elected as the 2028 host. Lindberg didn’t rule out the possibility that the IOC may adjust the timetable again. Aside from the two Koreas, Germany, Australia, India and Indonesia have expressed interest in hosting the 2032 Olympics. 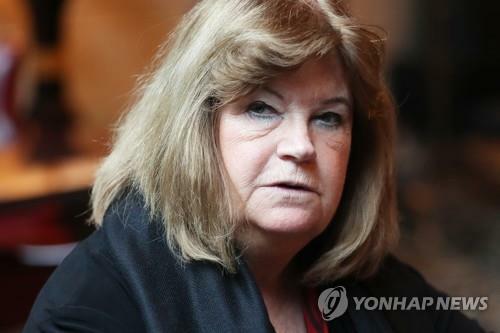 As the leader of the Coordination Commission, Lindberg, a veteran sports administrator from Sweden, was in charge of monitoring PyeongChang’s preparations for the Olympics and also offering any guidance as necessary to the local organizing committee. Lindberg and her team also conducted on-site inspections of competition venues and other facilities, and reported their findings to the IOC Executive Board. And during PyeongChang’s bidding stage, Lindberg served as the head of the IOC’s Evaluation Commission, whose main responsibility was to analyze PyeongChang’s candidacy. Lindberg said PyeongChang, located some 180 kilometers east of Seoul, has left its mark in the Olympic history with its cost-effective and athlete-friendly Games. In October, PyeongChang reported a surplus of US$55 million. Lindberg spoke about how PyeongChang was able to cut costs by downsizing its venues so that they wouldn’t be “gigantic things that nobody can use” and how the new apartments built as the athletes’ village were sold out before the Olympics, providing much-needed housing in the region. “The high-speed (KTX) train, for me, was one of the big legacies,” Lindberg said about the new railway completed just before the Olympics, connecting Seoul and PyeongChang, plus other areas in Gangwon Province. A typical drive from the capital to PyeongChang can take close to four hours, but the KTX covers the route in about 80 minutes. 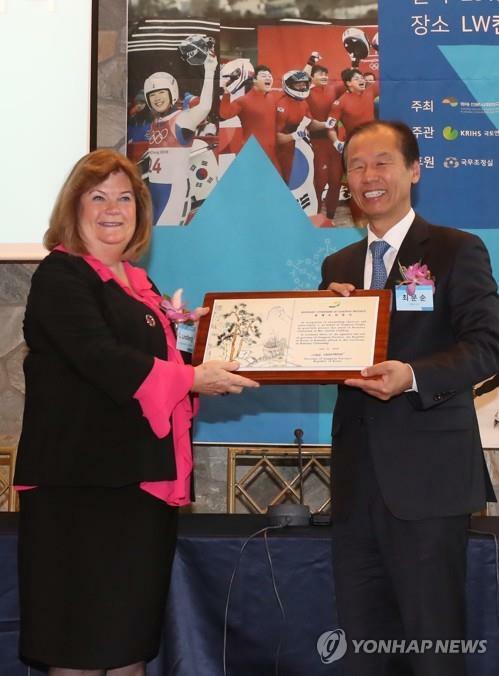 For her efforts coordinating Olympic preparations with PyeongChang, Lindberg received the Maengho (“fierce tiger” in Korean) Medal, the second-highest Order of Sport Merit, from the South Korean government. 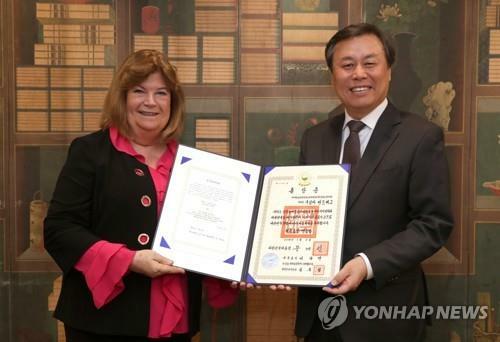 She was also named an honorary citizen of Gangwon Province. Seoul announced the decision to confer Lindberg with the medal in March, but she didn’t pick it up until Wednesday, when she made, by her count, her 40th trip to the country. The groundwork for the Koreas’ joint Olympic bid was laid out at the PyeongChang Olympics. The two marched in together at the opening ceremony and formed the first-ever unified Olympic team in women’s hockey. The Koreas continued to engage in sports exchange and cooperation, with friendly basketball matches held in Pyongyang and more unified teams being organized in table tennis, rowing, canoeing and basketball in international events. Lindberg said a winning Olympic bid by the Koreas can only help their relations.